Limousin houses may appear simple but it is a complicated art. In the past writers or “the powerful” were known to laugh at the Limousin people as they considered their traditional rural houses to be lacking in character. This judgement was hasty and more importantly, wrong. Limousin houses are original and vary from the use of different materials, roofs and craftsmanship. The houses in the Limousin are divided into two categories, small and big houses. 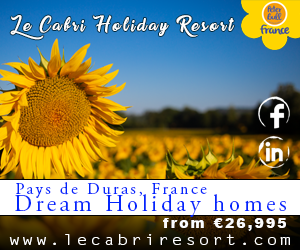 The first category is often cottages and is known as “cros de meijou”, an ancient phrase meaning “poor houses”. The later is thought generally to be occupied by “des habitants aisés”, people that are well off, as they even have a second floor. When the house comes with a large amount of land, this is known as “grosse” maison, a large house, and shows ones economic status. La maison basse monocellulaire/ a small house with one room, often with rustic paving slabs was known as a house for the poor. A quote from the “Les maisons des paysages d’ici” went as far as saying that the owners of these houses were only just welcome in Church and were buried in a shameful area of the cemetery. From this basic model, two varieties of houses emerged. Firstly, la maison pluricellulaire, a similar style of house, but with two rooms. The ground level was often risen leaving room for a cellar which was useful for a workshop or oven. 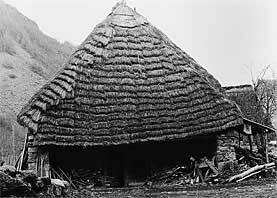 Secondly, la maison à étage(s)/ a house with two floors which is more frequent in villages and on road sides. The bourgeoisie generally lived in these houses and at the back of the property was a courtyard with outer buildings. This type of house can be confused with la maison à superposition, known as “the high” house, mainly built to the East of Saint-Léonard and Pierre-Buffière. These houses have two floors but the ground floor is used for keeping farm animals and the first floor as the living area. Sometimes there is a second floor as well which is used for bedrooms. La maison-ferme /the farm house is often made up of numerous buildings that are all on one level, and that serve multiple functions (living area, stables, barns, garage). This is the most wide spread type of house in the Haute Vienne as it caters for the peoples lifestyle and farming. As already mentioned, barns and stables are part of the property and are either for keeping animals or straw and hay. It is also important to mention the “grange-étable, the barn-cowshed, especially as it features so heavily in the Limousin. This style of oval building, which originates from mountainous regions started to appear in the Limousin at the late 18th,early 19th century. Only a few are left in the region however, as this type of building stopped during the 19th century. The houses in the Limousin blend in so well with the surroundings and beautiful countryside. The reason for this is that all the materials used for their construction came from within the region. In 1834, a contract was drawn up in Saint-Germain-les-belles, stating that the stone used for building should be taken from the local mines, that the mortar could be taken from wherever it were to be found within the region and even the water to mix the cement would come from local wells. It is no wonder therefore that the buildings blend in completely naturally with the countryside. Many of the rural houses in the Limousin were built or converted to suit the needs of the local artisans. They were generally not built for comfort but for practical use. If a farmer needed somewhere to store straw or cattle then he simply gave a builder his requirements and the work was carried out, thus houses such as “la maison à superposition” made their appearance in the region. In fact many houses were built without even consulting an architect, which explains the diverse, unique and original buildings found in the region. As for the rather old fashioned opinion therefore that the traditional rural Limousin architecture has no character or originality, on the contrary, many Limousin buildings are unique and display social and economic characteristics. After all the Limousin is the land of farming and artisans and the property of the limousin region displays this in a charming, and original manner full of unique character and architecture.